Pendrecht, one of the districts built on Rotterdam's southern rim during the post-war reconstruction, was originally intended to house those working in the nearby docks. 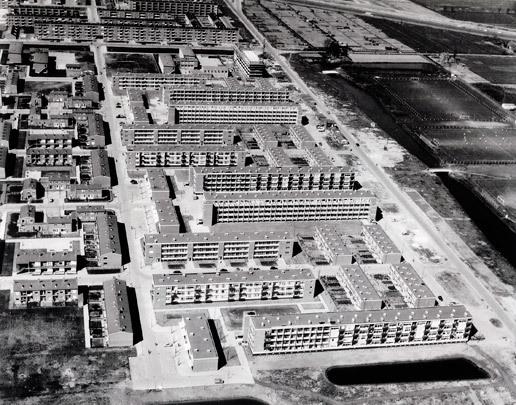 The fascinating thing about Pendrecht is the attempt it makes to organize its 6300 dwellings using an ascending series of spatial units: dwelling, cluster, neighbourhood, district, town. In 1949 Lotte Stam-Beese of the Urban Development and Reconstruction Agency drew up various plans for Pendrecht. 'Opbouw', the group of functionalist architects based in Rotterdam, was a likely influence on their final form. The district configures four neighbourhoods around a traffic-free square. Instead of the usual system of perimeter blocks or series of freestanding apartment buildings, the fundamental unit chosen for these neighbourhoods was the so-called wooneenheid (cluster), which can be considered a spatial and social link between home and neighbourhood. Each cluster consists of a mix of buildings catering to differing categories of resident. This social diversity is reflected in their spatial layout of freestanding blocks of differing height together surrounding a communal green space. The later, more common name for the cluster, 'stempel' or stamp, derives from the way in which clusters are linked in a strict orthogonal system. An ascending series is also recognizable among the different types of access. Cul-de-sacs with play space connect clusters to neighbourhood streets running between the taller blocks. A central access road running in an east-west direction joins the district to the city. The schools are accommodated in the district's centre and in a green zone linking this centre with Zuiderpark to the north. Shops are partly located centrally and partly decentralized throughout the scheme. Pendrecht greatly influenced ideas on urban design responses to the great post-war demand for housing during the 1950s. The political decision of the early 1960s to step up the building programme, however, left no room for patiently resolving such 'formal issues' and led to an over-proliferation of high-rise districts with no concern for either social relations or formal proportions. Large parts of Pendrecht are to be torn down in the years to come, with low-cost social housing being replaced by more expensive owner-occupied properties. The so-called 'fish-bowl' units designed by Harry Nefkens have been renovated.